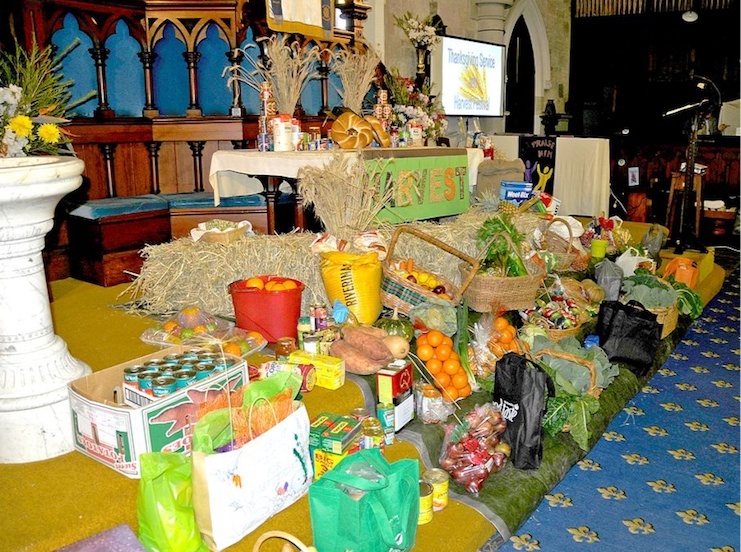 On Sunday, 19th August 2012, at 9.30am St Paul’s was vibrant with the fruit of the earth. 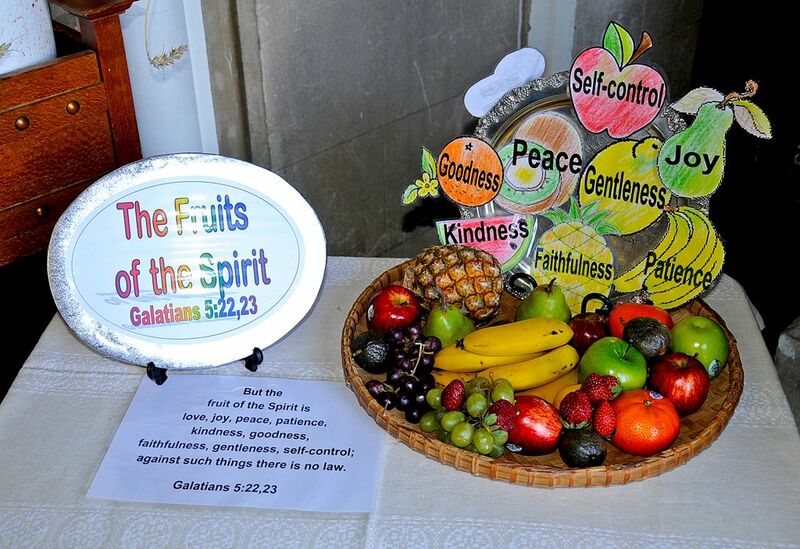 People were greeted on arrival with a wonderful sign made of fruit and vegetables, exhorting them to “Give Thanks”. The dais was resplendent with produce and non-perishable goods, given with thanks for our good fortune and wealth of food. During the service, we learned that the fresh produce will be used in the local community to supply those in need with nutritious food. The non-perishables and monetary donations will be transported to St George where the Presbyterian Church will distribute them to people in need there. The Right Reverend David Niven led the service, giving thanks for the earth’s bounty and dedicating the gifts. The Sunday School children performed a poem called, “This is the World that God made”, illustrating the process by which we receive our daily bread. In acknowledgement of the 149th Anniversary of the church, Deaconess Dianne Parker presented the first of a series of cameos, which will be presented during the sesquicentennial celebration year. We learned about the United Evangelical Church, which was founded by settlers who arrived on the Fortitude in 1849. Although this church was disbanded, it played a part in the beginnings of our own church. Chairperson of the Restoration Trust, Penny Floyd, told us about the achievements and plans of the Trust. The bird-proofing of the bell tower is complete but there were rumours of repeat offenders which had to be followed up. The tower remains secure. Next in the plan has to do with making sure the tower is strong enough to withstand ringing the bell; and removing stone work which is in danger of falling. Our service was beautified by the wonderful singing of “Accord”, the vocal ensemble from Somerville House, directed by Celia Mylne and accompanied by Carolyn Eisenmenger. The girls’ performance was excellent and we thank them sincerely for their participation. Following the sermon, in which Mr Niven encouraged us to “Praise the Lord, O my Soul”, the congregation enjoyed morning tea in the warm winter sunshine in the front yard of the church, while the children enjoyed Harvest Games. They played Rob the Farmer, participated in Broom and Potato relays, an egg and spoon obstacle course, apple dunking, tug of war and apple bobbing. It was hard to convince them to stop even after the adults had gone into the hall to enjoy a delicious lunch of homemade soup and bread rolls. What a wonderful day it was. With the weather reminding us how lucky we are to live in Queensland, and the bountiful produce reminding us how fortunate we are in Australia, it was only right that we praise God for his goodness and give thanks for his kindness. 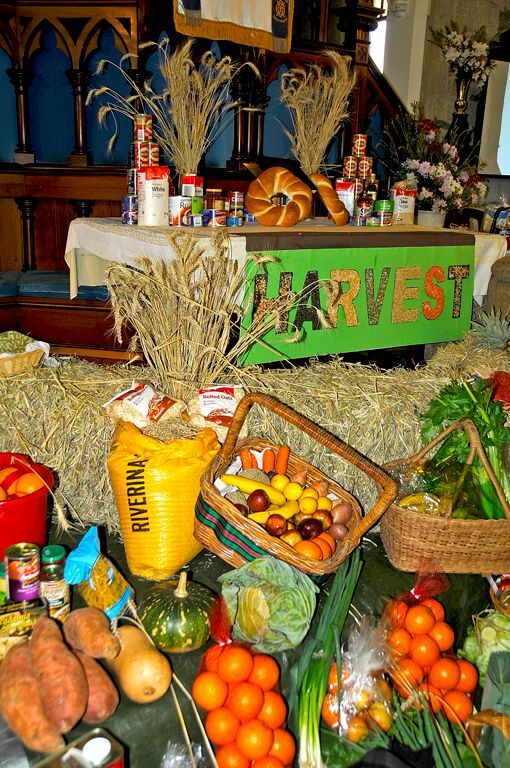 The modern British tradition of celebrating Harvest Festival in churches began in 1843. Hymns such as “We plough the fields and scatter”, “Come, ye thankful people, come”, “All things bright and beautiful” and also Dutch and German harvest hymns helped popularize the festival idea and spread the custom of decorating churches with home-grown produce for the Harvest Festival service. Harvest is from the Anglo-Saxon word haverfest, “Autumn”. 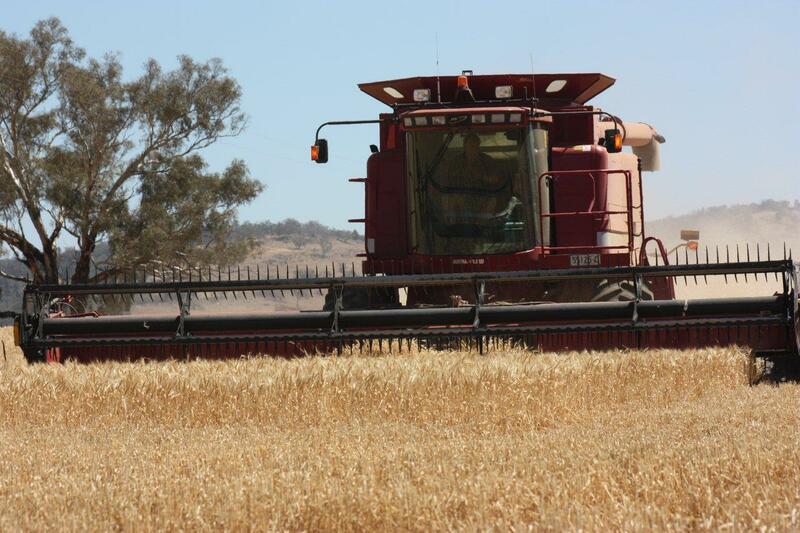 It then came to refer to the season for reaping and gathering grain and other grown products. An early Harvest Festival used to be celebrated at the beginning of the Harvest season on 1 August and was called Lammas meaning ‘loaf Mass’. Farmers made loaves of bread from the fresh wheat crop. These were given to the local church as the Communion bread during a special service thanking God for the harvest. 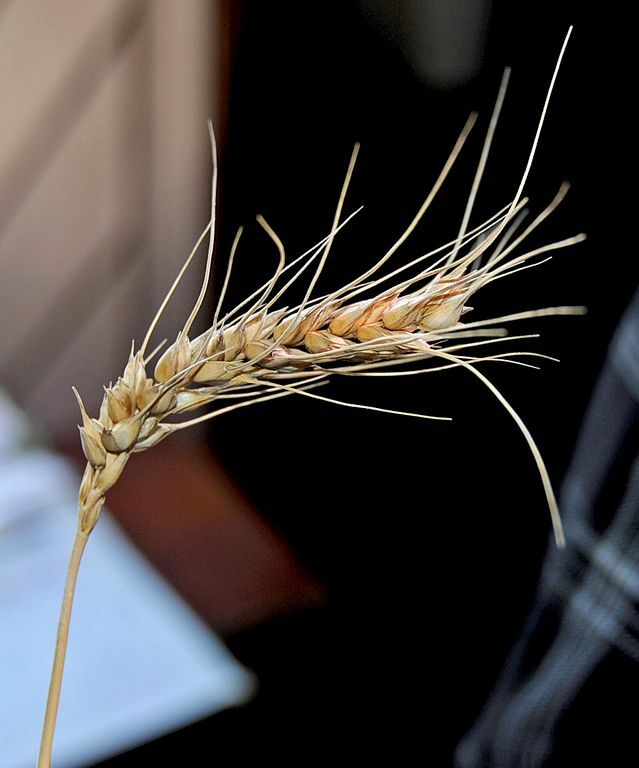 In the northern hemisphere, Autumn and August are closely aligned while for us here at this time of year, Spring is on its way and the crops of grain are only part way through their growth cycle with harvest being months away. Despite this, it was felt the essence of giving thanks for the productivity of the land and for all that we have would be a most appropriate theme for this year’s Anniversary service of Thanksgiving. It is also a significant way to mark the beginning of our twelve months of special activities leading up to celebrating the 150th anniversary of the congregation on 18th August 2013. 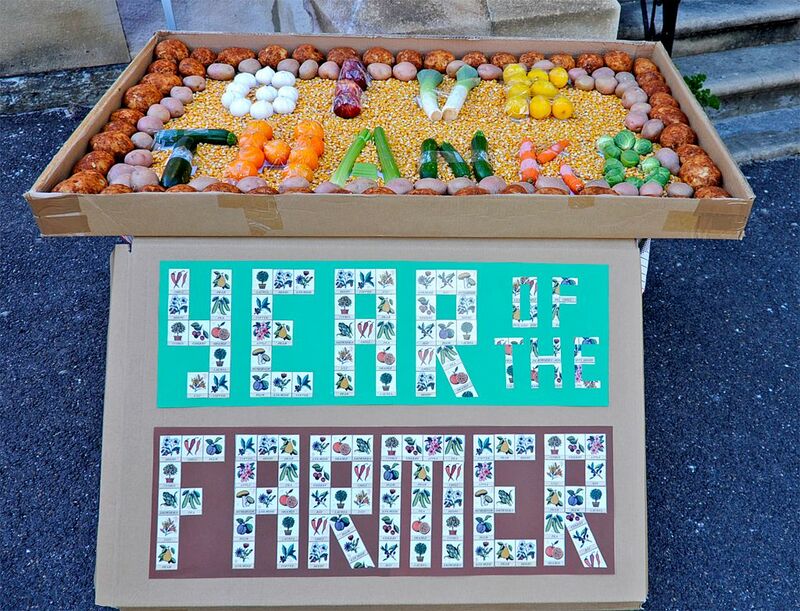 So to keep these customs alive, and also in recognition of 2012 being designated the ‘Year of the Farmer’, St Paul’s will be adorned with displays of fresh produce – fruit, vegetables, herbs, grains, bread, preserves, flowers – as well as pantry items and staples. The congregation is invited to also engage with this spirit of giving as there will be opportunity during the service to bring forward their own similar contributions. Now here’s the challenge! Families, couples, individuals are invited to create their own small display for the church – perhaps in a basket, a box, a vase, a sack, a wheelbarrow, a watering can, on a tiered plant stand, an old boot, on a mat or cloth ….. using artificial items, fresh goods, signs, Scripture verses or whatever your imagination takes fancy to. Displays would need to be placed in the church on the Saturday. If you would like to participate in this way, we’d love to hear from you.